Are You Curious About Kim Tae-hee’s Husband? Here Is Rain Bi’s Full Information! Kim Tae-Hee is an actress from South Korea who was born on March 29, 1980. Tae-hee is considered one of South Korea’s most beautiful women, and she’s best known for her roles in Korean dramas such as Stairway to Heaven (2003), Love Story in Harvard (2004), My Princess (2011), Yong-pal (2015), and many more. Tae-Hee rose to stardom in 2003 through her role as an evil stepsister in the popular SBS TV series Stairway to Heaven. In 2006 and 2007, she starred in The Restless and Mars Vs Venus, but both films were unsuccessful at the box office. In 2012, she informed the public that she was dating an actor-singer from South Korea, and they married on January 29, 2017. Jung Ji-hoon, better known by his nickname Rain, is a South Korean singer, songwriter, actor, and record producer. Rain debuted in 2002 in the music industry, and his career in music was very good. Rain’s musical career includes seven albums, 28 singles, and many concert tours around the world. He first achieved breakthrough success with his third Korean album, It’s Raining (2004), which gave birth to the number one single with the same title. 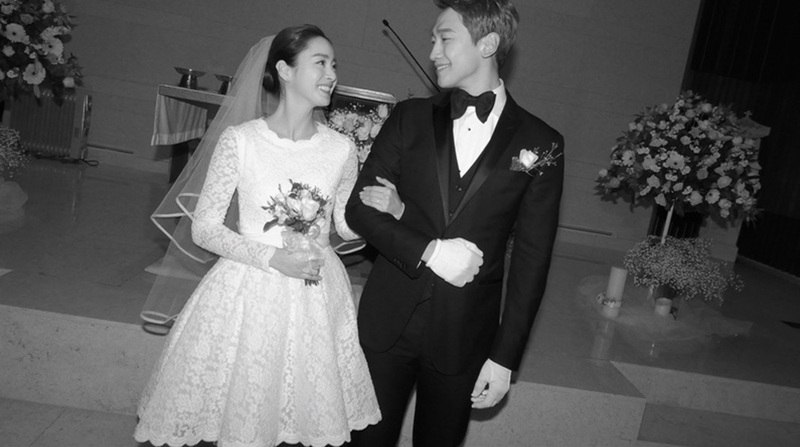 Rain and Kim Tae-Hee became married on January 19, 2017. They started dating secretly in 2012. Their first meeting was unique, that is, they fell in love at first sight. They met while starring in an ad, and they were so embarrassed, they felt like they were at an arranged marriage. While in the military, Rain willingly accepted punishment for meeting Kim Tae Hee during his enlistment while uniformed, which is an infringement. Their relationship wasn’t known to the public, but in 2014, the public suspected that they wanted to get married soon because Rain was baptized and entered the same religion as Tae-hee, Catholicism. As time went by, news of their relationship was revealed since in 2015 Rain and Tae-hee were always together. In 2017, they got married on January 19. In the beginning, they wanted to keep it a secret, but 2 days before their marriage, the paparazzi followed and photographed the wedding venue. They later had a daughter in October 2017.